This piece is one thousand words or about three printed pages long. Are these poems navigations, vagaries or nocturnes? Monk’s latest collection shows a continuing foray into the alchemy of language and a reclamation of the visceral soundscapes of loss and celebration. Naming the names in a carnival of appearances and manifestations. Perhaps pure zaum, for those feisty enough to interrogate the relationship to Khlebnikov’s futurist imperatives, but zaum combined with a rich humour, a delight in Northern dialect and idioms, and the here and now of modern kulchur. Though it is perhaps in the realms of a British expressionism that Monk’s work is best situated, and in the performative, punk necessity of a work built out of or upon forms of epiphany. But it would be missing the point to determine Monk’s primary modes in terms of subject; this poetry is all about form, fragment and process. If there is a risk here, it is in the cohesion of these threads and their pressures within pieces and sequences. The poems are at their best in the high-risk environment of invocation. Noctivagations collects together major works of the 1990s and in each of its nine parts informs and expands our sense of the linguistic procession of the world — a kind of saying the world into existence — a real-time tour engineered through dialogues and interrogations which are playfully charged with the immanence of things. We are taken through the process of creating poems, and can see the metal braces beneath the architecture, feel the wet concrete, see the frame fill out with rooms, and find them populated. Occasionally this range of techniques is applied to history too, and in the commissioned sequence on Manchester we find a kind of partial tour of the great Northern city in a performance piece which tries to draw the past into the present, a mode we find throughout Monk’s work, a kind of magical re-living, which shows her almost spiritual concern with the temporal pressure of the here and now. Far from looking jerry-built, careless or too immediate, the poems can seem little miracles of construction, and magic is never far from Monk’s repertoire — often overtly so, in ways which look at poetry’s relation to the black arts. This mystery of transformation often feels like an important attribute of Monk’s trajectory as a writer. The book ceaselessly plays on the mechanics of sense too, often working in short bursts of sound, neologisms, fractures, and incantations. The works worry away at meaning and intention, and those disturbances and accidents of memory and speech; the slips, errors and inversions that for Monk seem a kind of truth or proof of some deeper comrehension of actuality. The favoured technique is a kind of momentary coalescence of free-wheeling perceptions and momentary comprehension. At extremes this can be a miscomprehension which tries to symbolise the difficulty of unfiltered experience, a kind of pure reception of the totality of events. This is can be a persuasive and pleasurable technique, but is difficult to pull off; when Monk succeeds, the surprise of cognition is simply a knock-out. What surprises us here is the moral imperatives of this act of remembrance, a practice which sustains many of the best poems. And here at the outset of the book we find the children’s TV puppet, Looby Loo (a character in the 1950s show Andy Pandy), making a farcical guest appearance in a way which is both cultural memory and the comfort of half-remembered things, supporting us in some final childhood as we face death’s certainties, our only solace facing the unanswered question; and like Ives’ orchestral piece of that name, we share these multiplying threads of disparate music in a cacophony of the present. Transformations occur throughout the book and in the second sequence, Trilogy, ‘Prague Spring’ uses the Golem, a mythical Jewish agent of revenge, to almost heal history. Once again through a series of questions and answers we see this fairytale monster virtually described into existence, revitalising the Czech Republic in the wake of Soviet oppression. But this figure is strangely incomplete, and in the closing stanza, as if to complete the cycle of history in a magical circle of renewal, we are granted the means of ridding ourselves of revenge and repudiation, or perhaps condemned to repeat the cycles of persecution, revenge and retribution. This challenge is one perhaps the book as a whole presents, of the eternal now, of the totality of the present, where we must conduct ourselves, express our humanity and most of all find this carnival our best chance of salvation. Geraldine Monk was born in Blackburn, Lancashire in 1952. 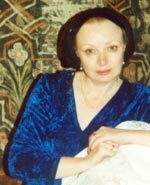 Since the late 1970 s her poetry has been published in many anthologies most recently appearing in the Anthology of 20th Century British and Irish Poetry (ed Keith Tuma, American Oxford). 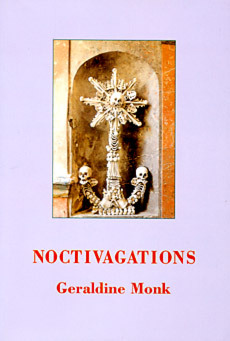 Noctivagations gathers together poems and prose written over the last seven years including the texts of her collaborative works with the musician Martin Archer. A Selected Poems will be published by Salt in 2003.